Why The Bluffs are the Best | Kids in T.O. One of our favourite escapes from the city in the city is The Bluffs. On the eastern shores of Lake Ontario in Scarborough is along stretch of beach, park, trails and dune-like cliffs. The views are spectacular. The beach is beautiful. And the exploring is endless. 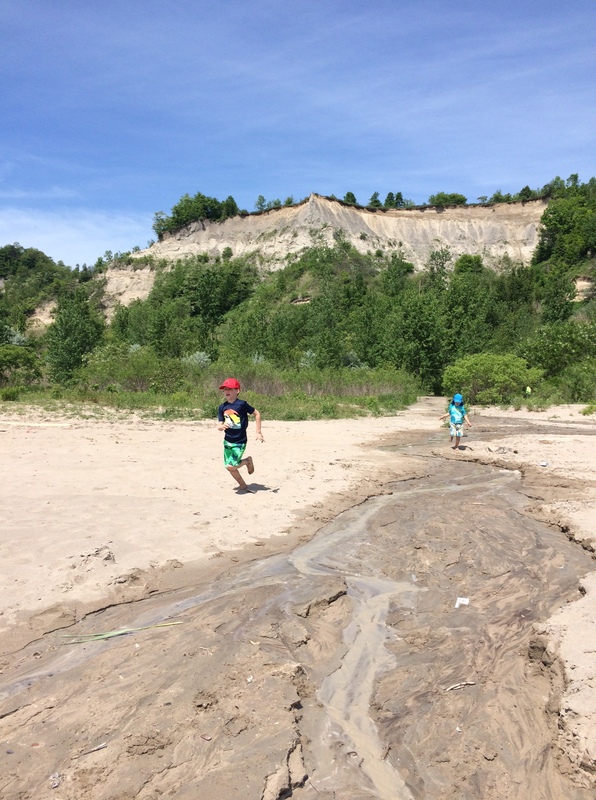 One of the boys’ favourite spots is the ‘clay river’ – a small stream from the Bluffs that flows into Lake Ontario creating some awesome muck to play in. The Scarborough Bluffs are made up of several different parks and gardens in the area, so a return trip is a must. Swimming: Despite Lake Ontario’s dirty rep, the City’s beaches are certified under the internationally recognized Blue Flag Program. (To score a blue flag, a beach must be safe for swimming for at least 80 per cent of the time and reassessed each season. From June to August, the City takes daily water samples from its supervised beaches and test of E.coli. Check and see how Bluffer’s Beach measures up. Snack & Picnic: Picnic areas with BBQs. Bluffer’s Park Restaurant. More Beach: More eastend beaches – Woodbine Beach and Boardwalk and Cherry Beach. Downtown: Sugar Beach.